East Fife's celebrations after Kevin Smith's opener didn't last. Picture by Kenny Mackay. Darren Young insists there is no panic around Bayview despite a chasing pack closing in on East Fife’s play-off spot. Defeat to Raith on Saturday, along with wins for Montrose and Airdrie at the weekend, and with Mo picking up another three points on Tuesday night, saw East Fife’s lead in fourth reduced to just goal difference. 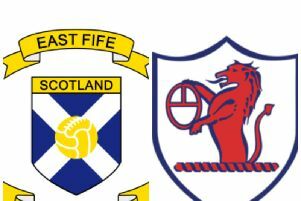 But with the Diamonds and Montrose the next two sides East Fife will face, there’s an opportunity there to cement their place inside the top four and end the hopes of the rest. And Young is determined to focus on the positives ahead of the trip to the Penny Cars Stadium. He said: “We’re still in a good position and there’s nobody panicking. “It’s tighter than we wanted it to be but things are still in our own hands. Young reckoned his side had shown up well on Saturday despite their eventual defeat. The Fifers had beaten Raith twice this season, drawing the first game, and had been the better in all three. Kevin Smith’s first half goal gave the side a cushion, only for Iain Davidson and Kevin Nisbet to net a late couple of counters for the visitors. Raith had the bulk of possession in the second half, but the Fifers had defended well until the very closing stages. Young admitted things had gone against his side late on, but refused to be too hard on his players despite the loss. He said: “When you watch the game back, Brett Long has come out and smothered one at the start of the second half but hasn’t had a lot to do after that. “We tried to make ourselves hard to beat and we matched them across the park. “So that makes it frustrating to lose the goals late on. “Even if we’d picked up the point we would still have been unbeaten against them this season. Young restored club skipper Kevin Smith to the starting XI and he linked up well with striker Anton Dowds. Smith’s first half goal gave East Fife a real lift and the manager reckoned he was more than worth it. He said: “Kevin was outstanding - but I’d say, for 87 minutes, everybody was. “I said to the players after the game that they were two minutes away from coming back into the changing room and celebrating. “They did absolutely everything we asked of them. “I’d be a lot more concerned if we weren’t creating the amount of chances we are in games. We have five games to play and teams will drop points between now and the end of the season. • Ahead of the Raith game East Fife announced that manager Young had signed a new deal, keeping him at the club for a further two years. Young was appointed East Fife manager in June 2017 with the club currently at its highest league position for 20 years.